For the Art Nouveau typeface, see Arnold Böcklin (typeface). Arnold Böcklin (16 October 1827Template:Spaced ndash16 January 1901) was a Swiss symbolist painter. He was born at Basel. His father, Christian Frederick Böcklin (b. 1802), was descended from an old family of Schaffhausen, and engaged in the silk trade. His mother, Ursula Lippe, was a native of the same city. Arnold studied at the Düsseldorf academy under Schirmer, and became a friend of Ludwig Andreas Feuerbach. He is associated with the Düsseldorf school of painting. Schirmer, who recognized in him a student of exceptional promise, sent him to Antwerp and Brussels, where he copied the works of Flemish and Dutch masters. Böcklin then went to Paris, worked at the Louvre, and painted several landscapes. After serving his time in the army, Böcklin set out for Rome in March 1850. At Rome, he married Angela Rosa Lorenza Pascucci in 1853. The many sights of Rome were a fresh stimulus to his mind. These new influences brought allegorical and mythological figures into his compositions. In 1856 he returned to Munich, and remained there for four years. He then exhibited the Great Park, one of his earliest works, in which he treated ancient mythology. Of this period are his Nymph and Satyr, Heroic Landscape (Diana Hunting), both of 1858, and Sappho (1859). These works, which were much discussed, together with Lenbach's recommendation, gained him appointment as professor at the Weimar academy. He held the office for two years, painting the Venus and Love, a Portrait of Lenbach, and a Saint Catherine. He returned to Rome from 1862 to 1866, and there gave his fancy and his taste for violent colour free play in his Portrait of Mme Böcklin, and in An Anchorite in the Wilderness (1863), a Roman Tavern, and Villa on the Seashore (1864). He returned to Basel in 1866 to finish his frescoes in the gallery, and to paint, besides several portraits, The Magdalene with Christ (1868), Anacreon's Muse (1869), and A Castle and Warriors (1871). His Portrait of Myself, with Death playing a violin (1873), was painted after his return again to Munich, where he exhibited Battle of the Centaurs, Landscape with Moorish Horsemen and A Farm (1875). From 1876 to 1885 Böcklin was working at Florence, and painted a Pietà, Ulysses and Calypso, Prometheus, and the Sacred Grove. From 1886 to 1892 he settled at Zürich. Of this period are the Naiads at Play, A Sea Idyll, and War. After 1892 Böcklin resided at San DomenicoTemplate:Disambiguation needed, near Florence. Böcklin died on 16 January 1901 in Fiesole. He is buried in the Cimitero Evangelico degli Allori in the southern suburb of Florence, Galluzzo (Italy). Isle of the Dead ("Die Toteninsel"), acquired by the Gottfried Keller Foundation in 1920. Influenced by Romanticism his painting is symbolist with mythological subjects often overlapping with the Pre-Raphaelites. His pictures portray mythological, fantastical figures along classical architecture constructions (often revealing an obsession with death) creating a strange, fantasy world. Böcklin is best known for his five versions (painted in 1880-1886) of Isle of the Dead, which partly evokes the English Cemetery, Florence, close to his studio and where his baby daughter Maria had been buried. An early version of the painting was commissioned by a Madame Berna, a widow who wanted a painting with a dream-like atmosphere. Clement Greenberg wrote in 1947 that Böcklin's work "is one of the most consummate expressions of all that was now disliked about the latter half of the nineteenth century." Böcklin exercised an influence on Giorgio de Chirico, and on Surrealist painters like Max Ernst and Salvador Dalí. When asked who was his favorite painter, Marcel Duchamp controversially named Arnold Böcklin as having a major influence on his art. Whether Duchamp was serious in this assertion is still debated. H. R. Giger has a picture called Hommage to Boecklin, based upon Isle of the Dead. Böcklin's paintings, especially Isle of the Dead, inspired several late-Romantic composers. Sergei Rachmaninoff (see Isle of the Dead) and Heinrich Schulz-Beuthen both composed symphonic poems after it. Rachmaninoff was also inspired by Böcklin's painting Die Heimkehr ("The Homecoming" or "The Return") when writing his Prelude in B minor, Op. 32, No. 10. In 1913 Max Reger composed a set of Four Tone Poems after Böcklin of which the third movement is "The Isle of the Dead" (The others are "The Hermit playing the Violin", "At play in the Waves" and "Bacchanal"). In Mark Robson's film Isle of the Dead (1945), Disney composer Leigh Harline's somber score makes use of Sergei Rachmaninoff's music. Hans Huber's second symphony is entitled Böcklin-Sinfonie, after the artist and his paintings. Otto Weisert designed an Art Nouveau typeface in 1904 and named it "Arnold Böcklin" in his honor. Adolf Hitler was fond of Böcklin's work, at one time owning 11 of his paintings. 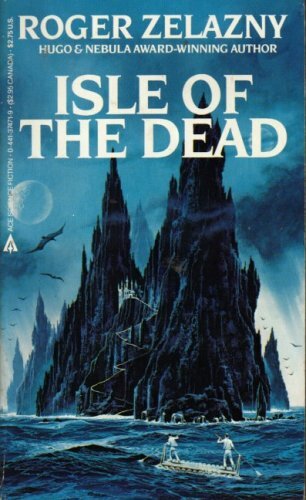 Roger Zelazny titled one of his novels Isle of the Dead after Böcklin's paintings, and an Ace books edition featured a cover painting by Dean Ellis that was deliberately reminiscent of Böcklin's work. Katalog der Böcklin Jubiläums Ausstellung (Basel, 1897). ^ "Gottfried Keller-Stiftung: Ausleihe und Reproduktionen" (in German). bundesmuseen.ch. Retrieved 2014-12-05. ^ Burroughs, Bryson. "The Island of the Dead by Arnold Böcklin." The Metropolitan Museum of Art Bulletin, Vol. 21, No. 6 (Jun., 1926), pp. 146–148. ^ Greenberg, Clement. Nation. 3/22/1947, Vol. 164 Issue 12, p340–342. ^ Holzhey, Magdalena (2005). Giorgio de Chirico, 1888-1978: the Modern Myth. Köln: Taschen. p. 11. ISBN 3822841528. ^ Vinocur, John. "The Burlesque, and Rigor, of Arnold Böcklin." International Herald Tribune. 12 January 2002. ^ "...And Call Me Roger"": The Literary Life of Roger Zelazny, Part 2, by Christopher S. Kovacs. In: The Collected Stories of Roger Zelazny, Volume 2: Power & Light, NESFA Press, 2009. 40x40px Wikimedia Commons has media related to Arnold Böcklin. Bocklin in "History of Art"
Brahms, Böcklin, and the Gesang der Parzen, by Eftychia Papanikolaou; article in Music in Art: International Journal for Music Iconography 30/1-2 (Spring-Fall 2005): 154-165.